Summary and Definition: The semi-nomadic Nez Perce tribe were fishers, hunter gatherers and traders of the Plateau cultural group. The Nez Perce, a Sahaptian speaking tribe, lived in parts of present-day Idaho, Washington, Oregon and Montana. . The names of the most famous chiefs of the Nez Perce tribe included Chief Joseph and Chief Looking Glass. The explorers of the Lewis and Clark expedition referred to the tribe as the Chopunnish. The name Nez Perce, meaning "pierced nose" was incorrectly provided by French fur traders who were generalizing about the customs of the tribes the Corps of Discovery would next meet, such as the Chinook in the Northwest Pacific coast, who favored nose rings. What was the lifestyle and culture of the Nez Perce tribe? The Nez Perce tribe were one of the most numerous and powerful tribes of the Plateau Culture area. They lived a semi-nomadic lifestyle fishing, hunting, or gathering wild plants for food. They lived in pit houses in the winter and and tule-mat lodges in the summer. The introduction of the horse in the 1700's brought about a change in lifestyle and many of the people traveled to the Great Plains to hunt buffalo. They adopted some of the ideas of the Great Plains native Indians including the use of the tepee which were covered with buffalo hides and some items of clothing made from buffalo hides. The rich grasslands of the Nez Perce territory enabled the tribe to become horse breeders and traders and they raised some of the largest horse herds of any Native American Indian group. They are famous for breeding the sturdy, spotted horses now called Appaloosas, that were named after the Palouse tribe. The Lewis and Clark expedition encountered the Nez Perce during their explorations and Meriwether Lewis described the Appaloosa in his journal dated February 15, 1806 "Their horses appear to be of an excellent race. They are lofty, elegantly formed, and durable". Where did the Nez Perce tribe live? The Nez Perce are people of the Plateau Native American cultural group whose territories covered hundreds of miles from the Bitterroot Mountains of Idaho, west to the Cascade Mountains of Oregon and further westward to the state of Washington and eastwards to Montana. The geography of the region in which they lived dictated the lifestyle and culture of the Nez Perce tribe. What did the Nez Perce tribe live in? The Nez Perce were semi-nomadic and needed shelters that were easy to set up and take down. The Nez Perce lived in one of three shelters, depending on the season. The types of shelters were a semi-subterranean pit house, a tepee or a tule-mat lodge. The summer shelters, the tepee and tule-mat lodge, were above ground. Tepees were covered with animal skins but the tule-mat lodge was covered with mats of strong, durable, tule reeds (bulrushes). What language did the Nez Perce tribe speak? The Nez Perce tribe spoke in a Sahaptian dialect of the Penutian language. They call themselves 'Nimiipu', which means "the people". Lewis and Clark encountered the Nez Perce tribe in October 1805. They used new canoes built with the help of the friendly Nez Perce Native American Indians. The canoes enabled the expedition to float downstream from the Clearwater River Idaho, the Snake River into the Columbia River in the state of Washington. Who were the allies and enemies of the Nez Perce tribe? The allies of the Nez Perce tribe were many of the other Native American Indians who inhabited the Plateau region including the Cayuse, Walla Walla, Spokane, Coeur D'Alene, Yakama and Palouse. The main enemies of the Nez Perce tribe were the Great Basin groups to the south, including the Shoshone, Northern Paiute, and the Bannock tribes. The Nez Perce War was fought between June - October 1877. It was led by Chief Joseph, his brother Ollikut, White Bird and Chief Looking Glass. The Nez Perce fought a series of battles and skirmishes with General Howard and later, Colonel Nelson A. Mileson in a fighting retreat that covered 1,170 miles. The Nez Perce stopped at the Bear Paw Mountains in Montana, about 40 miles from the Canadian border. It was here that they fought a 5 day battle against Colonel Miles's troops. On October 5, 1877, Chief Joseph, leader of the Nez Perce, was forced to surrender to the US forces and the short, ill-fated Nez Perce War came to an end. What food did the Nez Perce tribe eat? What weapons did the Nez Perce use? The weapons used by the Nez Perce were spears, knives, bows and arrows and clubs. What clothes did the Nez Perce men wear? Traditional Nez Perce clothes were made of shredded cedar bark, deerskin, or rabbit skin. However with the introduction of the horse, and the ability to hunt buffalo on the Great plains, they used buffalo hides to make their clothes. The clothes worn by the men varied according to the season but generally they wore breechcloths and leggings, shirts and robes. Blankets and gloves were frequently used to keep out the cold. Nez Perce clothes were often belted and they wore moccasins on their feet. It was customary to decorate their clothes with fringes. Breastplates were worn for decoration purposes and made from the narrow dentallum shells acquired in trading with the coastal tribes and later they were made from buffalo bones and were called "pipe bones". Armbands, wristbands and anklets were also worn for special ceremonies. Headdresses were made of feathers, but did not trail to the floor. Their hair was kept long and decorated with plaits and beads for special occasions. What clothes did the Nez Perce women wear? The Nez Perce women during the 1700's large basket hats they wove out of dried leaves and plant fibers. The women of the tribe wore long dresses that covered them from the neck to their mid calves. The women also wore knee length moccasins during the winter. The Nez Perce made a large bag called a parfleche to store and carry their food and clothing. Parfleche were made from tough hides, and were often beautifully decorated. Nez Perce Clothes were decorated with beads made from a variety of materials that included shells, bones, pebbles, claws, nuts, seeds, porcupine quills, horns, pieces of metal and bird talons. What was the religion and beliefs of the Nez Perce tribe? The religion and beliefs of the Nez Perce tribe was based on Animism that encompassed the spiritual or religious idea that the universe and all natural objects animals, plants, trees, rivers, mountains rocks etc have souls or spirits. The Nez Perce believed they had a personal link with nature in the form of a guardian spirit, or wyakin, that protected them from harm and provided assistance during their life. Who were the most famous leaders and chiefs of the Nez Perce tribe? The most famous leaders and chiefs of the Nez Perce tribe included Chief Joseph and Chief Looking Glass who both fought in the Nez Perce War (June - October 1877) against the US Government. They led the following battles in the Nez Perce war including the Battle of Clearwater Creek in Idaho, the battle at Big Hole Valley in Montana, Camas Creek in Idaho, Canyon Creek and Cow Island in Montana, and the battle at Bear Paw in Montana. Nez Perce History Timeline: What happened to the Nez Perce tribe? 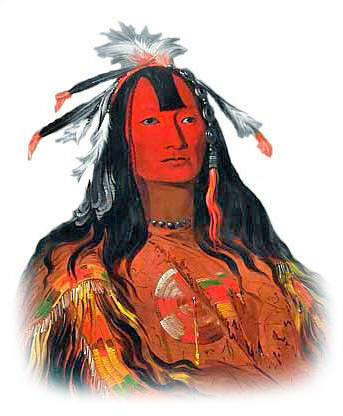 The following Nez Perce history timeline details facts, dates and famous landmarks and battles fought by the Nez Perce Nation. The Nez Perce history timeline explains what happened to the people of their tribe. 1843: The first major migration along the Oregon Trail took place in 1843 which led to violent conflicts with the white settlers who traveled along the Oregon trail in wagon trains. 1877: October 5, 1877, Chief Joseph was forced to surrender. For additional facts and information refer to the legend and the Story of the Nez Perces and the Poncas and the Story of Chief Joseph.